Nitroglycerin, which treats impaired cardiac function through vasodilation as it is converted to nitric oxide, is used worldwide for patients with various ischemic and congestive cardiac diseases, including angina pectoris. However, its efficiency differs widely among individuals. Some reports show that nitroglycerin has no effect in more than 25% of Asian people because of the gene mutation. Nitroglycerin tolerance is a result of inactivation of aldehyde dehydrogenase 2 (ALDH2). ALDH2 is the key enzyme for the biotransformation from nitroglycerin into effective metabolite nitric oxide (NO). A research, conducted by Rui jin Hospital of Shanghai Jiao Tong University and School of Life Science of Fudan University, found that when ALDH2 rs671 mutation happens (Glu504Lys), the enzyme activity of ALDH2 decreases more than 10 times, which weakens its ability of releasing NO. Therefore, ALDH2 genotyping is essential before accepting nitroglycerin treatment. The ethanol detoxifying pathway in humans occurs mainly in the liver and is carried out by two enzymatic steps.The primary enzymes involved in alcohol metabolism are alcohol dehydrogenase (ADH) and aldehyde dehydrogenase (ALDH). ADH1B is one of most important ADH genes, and SNPs in ADH1B will result in the production of enzymes with different activities. The presence of ADH1B *2 allele would be associated with an increased oxidizing capacity. Ethanol metabolism occurs in two steps: ethanol is metabolized quickly by alcohol dehydrogenase (ADH) to generate acetaldehyde. Acetaldehyde is then metabolized by the mitochondrial aldehyde dehydrogenase 2 (ALDH2) to acetate. 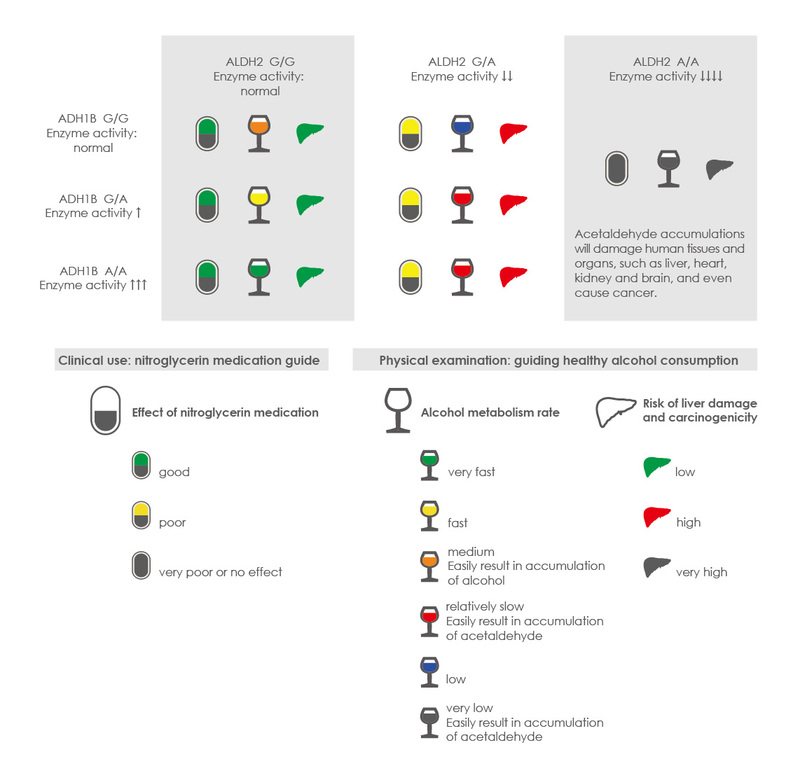 ALDH2 is better known for its critical role in ethanol metabolism, which is probably the only ALDH enzyme that contributes significantly to acetaldehyde metabolism. The ALDH2*2 carriers have a lower ALDH2 enzymatic activity and this deficiency is manifested by the characteristic facial flushing, headaches, nausea, dizziness, and cardiac palpitations after consumption of alcoholic beverages. 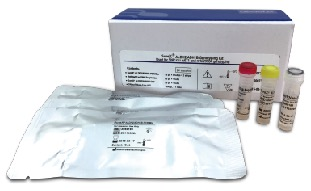 Applying Advanced Fragment Analysis (AFA) technology, the kit provides fast, accurate and effective genotyping.It simultaneously amplifies 2 SNP loci of ALDH2 and ADH1B in one tube and separates the different size of fragments by capillary electrophoresis. It is used for nitroglycerin medication guidance and healthy alcohol consumption advice. Yifeng Li, Dandan Zhang, et al. Mitochondrial aldehyde dehydrogenase-2 (ALDH2) Glu504Lys polymorphism contributes to the variation in efficacy of sublingual nitroglycerin. J Clin Invest. 2006 Feb; 116(2):506-11. Peng GS, Yin SJ. Effect of the allelic variants of aldehyde dehydrogenase ALDH2*2 and alcohol dehydrogenase ADH1B*2 on blood acetaldehyde concentrations. Hum Genomics. 2009 Jan; 3(2):121-7. Quillen EE, Chen XD et al. ALDH2 is associated to alcohol dependence and is the major genetic determinant of "daily maximum drinks" in a GWAS study of an isolated rural Chinese sample. Am J Med Genet B Neuropsychiatr Genet. 2014 Mar; 165B(2).